Generally, Outsourcing is assigning a particular task to a team of people who are experts in that specific field. It will give benefit for both parties. So, We can consider this as a Win-Win approach. For example, a Garment manufacturing company may need skilled people for packing the dresses once after completing the stitching. If particular Garment Company is not having enough skilled people and equipments for doing packing, they can outsource the packing task to a third-party who can do it easily. It will allow the Garment company to concentrate on their core business while the third-party packing company can get good benefit without having any exposure to the Garment industry. Now, many organizations prefer to outsource whole operations to another company. These outsourcing companies are most commonly known as Business Process Outsourcing (BPO) and Information Technology Outsourcing (ITO). 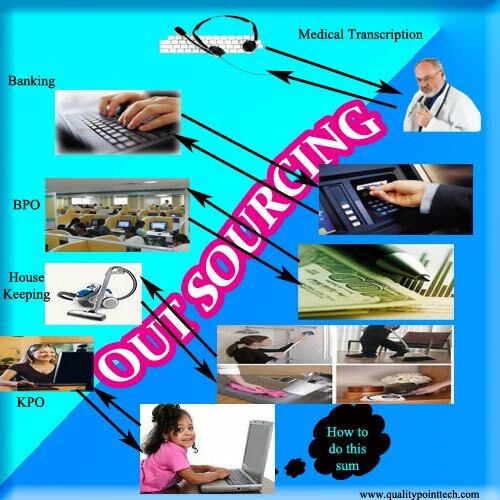 A Business process outsourcing (BPO) usually includes Call Center Outsourcing, Human Resources Outsourcing (HRO), Finance and Accounting Outsourcing, and Claims Processing Outsourcing. Outsourcing gives lot of advantages. Find below some of them. -Outsourcing helps you to focus on your core Activities. -Complicated Back-office functions can be done cost effectively and easily using outsourcing. For example, a small doctor's office can accept a variety of insurance plans, if they outsource it to a firm specialized in medical billing. -Overhead costs can be managed effectively by moving the task to some other place thro' outsourcing. -Outsourcing gives staffing flexibility. For example, outsourcing helps to get required resources during tax season and auditing periods. -On-site outsourcing of the project will bring people with the skills you need into your company. And, outsourcing gives disadvantages also. - You may loss your Managerial Control as another company will be taking care of entire task. - You may need to pay unexpected additional charges while implementing outsourcing. - There will be a risk of having threat to Security and Confidentiality of data. - Your internal staffs may not extend their full support for smoothly moving the tasks to the service provider. - You can not expect your desired Quality from the service provider. And, you will not have enough controls to increase the Quality. - You may get bad publicity as currently outsourcing is being viewed as source of job losses. Even if the concept of Outsourcing is Good, it may not work always. If it is not done correctly, it will do more harm than giving benefits. The core strength of the outsourcing depends entirely on choosing appropriate Service provider and creating the contracts by considering various aspects of outsourcing. Freelance sites such as freelancer.com are playing significant role in implementing outsourcing of very small IT (Information Technology) related tasks such as web site design, programming, scripting, small application development, SEO, and article writing. These freelance sites will act as a Market place for buying and selling services. The project providers can list their requirements and the service providers can bid for those projects. The processes and terms will vary according to each freelance site. I will write a separate post about the details of popular freelance sites. You need to be very careful when choosing these freelance sites. They may waste your time and therefore you will loss your money. The irresponsible behaviour of such a freelance sites will affect both the outsourcing guy and the service provider. So, you need to be very careful when implementing outsourcing. According to US president Barack Obama, outsourcing is the main source for job losses in US. I am not sure whether this assumption is correct or not. But I can say that your business will be affected if you are doing outsourcing in improper ways. Normally Outsourcing refers to buying goods and services, which in the past may have been done within the company, from outside vendors. Offshoring means buying services from outside the home country. Anyway these terms are sometimes used interchangeably. Wow, Excellent post. This article is really very interesting and effective. I think its must be helpful for every new freelancer. Thanks for sharing your informative.